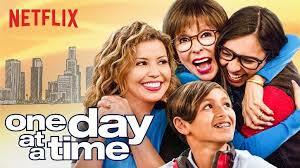 One Day at a Time is the new Netflix-original drama-comedy show that follows a Cuban-American family as they overcome obstacles one day at a time with the support that they have as a family. With a 97 percent approval rating from Rotten Tomatoes and a 7.62/10 average rating, the show offers something new and different, and yet familiar. Inspired by a series with the same name, the show follows a mother, Penelope Alvarez, a veteran and a nurse who fearlessly faces the challenges of her mental health and provides amazing support for her two children with a great amount of sass and admirable confidence, the grandmother, Lydia, who glamorously provides a back bone to the family, Alex, a 13-year-old boy, and Elena, a 17-year-old girl with straight A’s and a passion for justice. The show is a perfect mixture of heart warming moments, comedy, and serious subjects such as racism, immigration, politics, misogyny, and coming out as queer. The kinds of topics media often struggles or hesitates to address. Each episode guarantees moments of laughter, thought provoking moments, and at times a bit of tears, both happy and sad. For the Alvarez family their culture and heritage is very important and a source of pride. The grandmother often talks about glorious days she had in Cuba and how she escaped to the United States as part of a dance program to flee the political upheaval of the time, and she helps the family stay close to their cultural identity. Moreover, Elena Alvarez is a character that offers something completely new. As a typical nerd and captain of the debate team, she continuously argues against anything and everything that she deems misogynistic or in any way prejudiced. She even refuses to have a quinces, a Latin American celebration of her womanhood, because she believes it is sexist, and later on in the show she also comes out as lesbian. As the show follows her story, a great amount of support and acceptance comes from her family, but it’s as for her father, he struggles to accept her identity and walks out of her life. Laughter, tears, anger, and lots of love comes from the Alvarez family throughout the two seasons currently out, and it’s an eye opening and enjoyable experience to see these moments unfold. The show claims to be progressive but hates Cuba?